We have just discovered that Jean Ross passed away on January 15, 1996 in Marine City, Michigan. There are few around these days who would remember Jean, but she was one of Suzuki's earliest and most important disciples. The child of Prescott and Alice Ross, Jean was born in Detroit Michigan on August 16, 1916. Her mother’s father was a Methodist minister and she had a strong Christian upbringing. We know very little about her life because she didn't talk about herself much, but she did say that her interest in China and Japan began when she was fifteen years old and that from then she read everything she could find on that part of the world. Suzuki wrote on her curriculum vitae that she studied the doctrine of Christianity in college and also was reading about Buddhism at that time. Just a week or so after Shunryu Suzuki first arrived in San Francisco, at the very end of May, 1959, Kazumitsu Kato, his part-time assistant at Sokoji in Japantown, brought him to meet his class on Buddhism at the American Academy of Asian Studies. There Suzuki met Jean Ross, Betty Warren and Della Goertz. They immediately took to this new Japanese priest who said very little, had enormous personal charm and presence, and who taught them how to practice zazen that evening. Before long they were going to Sokoji at 5:30 in the morning to sit zazen, and of the original group, only these three continued through the years. They were pillars of the early days before Zen Center, helping to support Suzuki both financially and with their constant presence in the zendo. Betty and Della had started going later on in June, but Jean didn't join in till the end of the summer when she got back from a trip to Europe. She was a nurse living in Oakland by Lake Merritt and had no car, but she managed to be in San Francisco three days a week. She went to the Wednesday evening lecture, joined the Saturday morning schedule of zazen, cleaning, and breakfast and stayed over for the Sunday lecture. Eventually she moved to San Francisco so she could be in the zendo every morning. Jean had some trouble with sitting on the floor, but she persevered. In a 1969 interview with Peter Schneider for the Wind Bell, Jean talked about her first sesshin, revealing her direct no nonsense point of view. I still have a temper, you know. I can just swear just like that. But anyway, I got awful mad 'cause I was so damned uncomfortable. I don't care what they say, if you're on the heavy side this is pretty hard. It's my own fault. If I'd just pushed myself away from the table I could be thin like Bill Kwong. There were several pillows under me and I got up and thought, "these aren't doing a damned bit of good." And in just a few minutes Reverend Suzuki came by quietly and put another one under me (laughing). No. I feel that basically all human beings are alike. We have the same instincts, and I reacted to the Japanese people just as I would to our own, you know, as people. I met them on an individual one-to-one basis, and as far as being in an all male monastery, well that had advantages and disadvantages. Sometimes it's hard for a woman in a situation like that but also they were very good to me. Anyway, I had a very warm relationship with those I studied with. In fact I feel they know me better than my friends and even my family here in the states because there was a very vital life at Eiheiji. When she returned, Jean continued her study with Suzuki. 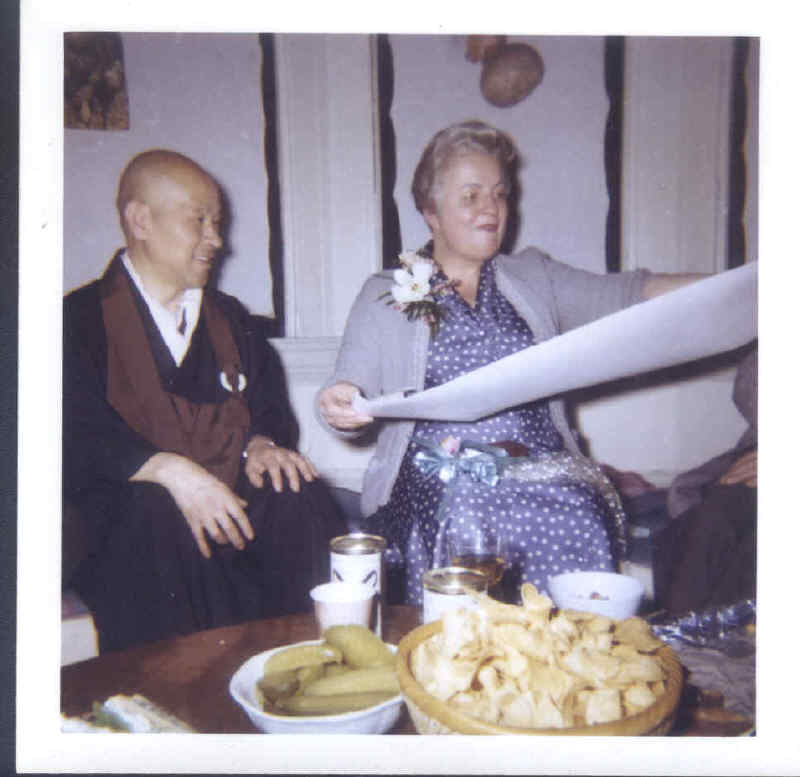 In 1965 she and Grahame Petchey, who had gone to Eiheiji after Jean, became the first and only students to share the Wednesday evening lecture schedule with Suzuki and Katagiri at Sokoji. In 1968, a year after Tassajara was founded, Jean moved to nearby Carmel and started her own zendo with blessing of Suzuki. In the fall of 1969, at the urging of Suzuki, she had the position of shuso, head monk, at Tassajara. She didn't want to do it-she' said she’d done her monastery time and was more interested in a low key lay approach to Zen practice-sitting once in the morning, reciting a brief sutra and going about her day as they had in the early days at Sokoji. So insistent was Suzuki that she do it, that the prior spring practice period had no shuso, the only time that ever happened. He said we had to wait for Jean to take her turn, that her ordination had actually preceded all the prior shusos. So she did it. Suzuki considered that she had been ordained as a priest for him by Kumazawa while she was in Japan. It’s unclear what the nature of that ordination was, but to Suzuki, who was not a predictable stickler to formalities, she was a priest. When she returned to Carmel after the practice period, she began to wear priest robes for her weekly zazen group instead of the old-fashioned pressed flowered dresses and rakusu she had worn up to then. Jean’s devotion to Suzuki and his to her could not keep her close to the Zen Center as it grew into an institution too large and impersonal for her taste. She felt that students were becoming dependent on an institution that was not fostering their strength as much as being their security blanket. She resigned from the board because she felt that Richard Baker was still running Zen Center from Japan. Yvonne Rand remembers reading a letter from Baker to the board which had to do with various decisions they had to make. Jean was upset not only with the board but with Suzuki. She felt it was not right for Baker to be in Japan and for others not to have the opportunity to develop and lead. When Suzuki was dying, aside from her sadness at his condition, Jean became distressed that Baker was coming back to be the new abbot. She had been an early fan of Baker’s and was the person who nominated him for president of Zen Center to succeed her early in 1966. She was in awe of his organizational and fundraising abilities, but she could not accept the direction that Zen Center had taken. She felt it had become too competitive, goal-oriented, impersonal, unfriendly, and hierarchical. She liked the people individually but had lost her love of the collective. Jean, like everyone who had been there back then, missed the intimacy of the early days when things weren’t so serious and they’d have time to get to know each other and see Samurai movies together. Now there’s striving to do more than another person or get more attention than the other person. You see, in the early days, and I think that’s still the very very best, it was different. Reverend Suzuki in the early days never talked, and he still doesn't to my knowledge-he really knows what he's doing-he never talked about striving for satori. The master/disciple relationship didn't come into the picture as strongly I don't think as it does now - not because of people not wanting close contact with him. We had it. (Chuckle.) I mean, there were only about six or twelve of us. We ate together and when we sat at the table with him, for example, we could watch every move that he made. Now, it's sort of hard for a lot of people to see him. At the table we didn't talk much although I'd get off into giggling fits half the time. We could watch him fix tea for us and stuff like that. And it was really good. But anyway, one of the most important things he talked about, as far as I was concerned, was you practice zazen without any thought of return-without any striving after satori or anything else. It wasn’t that Jean wasn’t interested in the practice and just wanted a nice social situation. Here she's describing what it was like in the zendo with Suzuki back then. I think he was more strict in some ways though. For example, he really growled and caused a bit of trouble if we moved. He was very very strict on us sitting still, absolutely still, and he'd jump on us if we'd moved. I don't think he's quite as strict on us as he used to be. Before Suzuki’s death, Jean encouraged Katagiri to come to Monterey to teach there. He’d been the person at headquarters in Tokyo who was responsible for foreigners back in 1962 and he met her at the airport and took her to Eiheiji. Later she visited him and his wife at his temple, Taizoin, not far from Eiheiji. Katagiri came to Monterey in December of 1971 right after Suzuki’s funeral. Jean’s group merged with his but in the summer she informed him that she didn't feel comfortable with his formal style and all the zazen periods and sesshins. Katagiri didn't last long there anyway and in December of 1972 he moved with his family to Minnesota where he taught for the rest of his life. Soon afterwards Jean left for Minnesota, having informed her students that she had obligations to take care of there. She encouraged them to keep sitting and to go practice with other groups if they could. She wasn’t trippy. She was pragmatic and wanted us to have a grounded practice. I was pregnant and went to her about it. I didn't know whether to get an abortion or not. I didn't know what she would say. She didn't say anything about Buddhism or about precepts. She was sensible and direct and just tried to help me. She didn't tell me what to do. After seeing her it was something I could deal with. I knew Jean back then. I’d met her at Sokoji in 1966 and I had lived for a while in the Monterey area and studied Japanese and I sat with her there. Suzuki refused to let me have anyone sit with me and told me to sit with her and help her out-that she was a teacher and I wasn’t. I got to know her a bit better during that time and I kept up with her till she moved back to Michigan. I have talked to her oldest friends and some of her students from back then, gone over everything I could find on her and remembered in our relationship, and I feel that Jean left with a broken heart. Baker knows this and he feels bad about it. One of Suzuki's final requests to Baker was to keep in touch with the older students, and he tried with Jean, but all he ever got in return was a manila envelope with her notes of early Suzuki's lectures. She did not return her best friends’ Betty or Della’s letters or cards or keep up with the Zen Center. In 1989 she sent the metal top of a hyakujo, a staff with rings that clangs when you walk to be used for begging and told Baker she didn't need it anymore. Occasionally she would send donations to Katagiri's group in Minneapolis. She sent a note of condolence to Tomoe Katagiri when her husband died. The only other person I know of whom she wrote to was Mark Lewis who had started off his Zen studies with her in Carmel while a high school student. He’d gotten her address from Tomoe Katagiri. Jean had responded with a brief note to his letter but not to the next one. In 1994, Mark passed that PO box on to me. I’d been collecting as much of the oral and written history surrounding Suzuki as I could. But I sat on it - I knew she wouldn’t want to talk to me. And she had left quite a bit in terms of a record. But this year, 1997, in May, I decided to try to find her. I called the post office in Marine City just outside of Detroit and found that number was registered to a lawyer. I wrote "to whom it may concern: and inquired about Mrs. Jean E. Ross as was written on a curriculum vitae that I had found with a pile of others in the Zen Center archives-the "Mrs." was a mistake that Suzuki had written-she’d never been married. I had photocopied it a few years ago along with reams of other info. Her birth date was also on that sheet and a private investigator used that info to check the death records for Michigan. A week later both answers came two days apart. She had died over a year before in St. Clair County, Michigan. She had a Methodist funeral at the Algonac Funeral Home and was buried at Woodmere Cemetery in Detroit. I called the lawyer, a Mr. Foster, and spoke to his wife and secretary. Her husband had been Jean’s family lawyer for some time. Mrs. Foster said they knew Jean quite well and that she would stop by the office at times just to chat and reminded her of Mrs. Santa Clause. She said that Jean had gotten Alzheimer’s disease rather young and had to move to a nursing home in August of 1994. She died peacefully at about six in the evening of January 15, 1996 in the company of a nurse who had brought her dinner. Mrs. Foster says that Jean never mentioned that she had been a Buddhist but had brought up that she’d been to Japan. She had gone through Jean’s personal effects. There was very little-nothing there to indicate Jean’s twelve years of Buddhist study and teaching-no robes, rakusu, Buddhist books or personal papers. There was an unusual bracelet, possibly a Buddhist mala, that she specifically left to her niece in her will. For a year or two before her departure from California Jean had said she had to go back home to take care of her old mother and aunt. Her mother had lived to be 105 and had died in 1985. Her aunt, Florence Potts, lived to be 110 and died in 1995. She spent most of her time with her old friends or at her apartment. Little by little her old friends were gone. As always, Jean had lived frugally and had been somewhat concerned about her finances since she had the three of them to take care of. When her mother died it was discovered that she had stock worth a great deal of money--millions. Jean was surprised to learn this but did not alter her life style one bit. She died a very wealthy woman with no need for wealth and left everything to her niece and nephew. Jean had made a complete break with her Buddhist past and finally with her human life, a life of learning, simplicity and service in which she seems to have continued to apply the spirit of Buddhism like Layman Pang - without sentimentality or submitting to any particular form or name. Gone beyond her Christian name: Jean E. Ross. Gone beyond the Buddhist name that Suzuki had written on her curriculum vitae in 1963: Ryoun - Surpassing the Clouds.